Eating healthy and not giving in to temptation are the two major challenges while you are on a diet. May it be Paleo, Vegan or Keto, it appears complex with a list of have-nots than haves. Scott Gooding in his recent book introduces the Keto Diet as a 60-day protocol to boost your health. 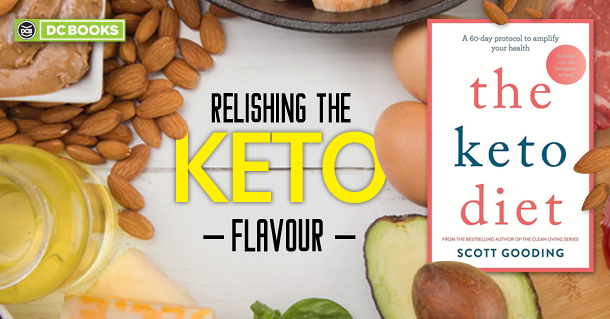 With over 150 recipes that would reap the benefits of a Keto diet, the book offers the science behind the sustainable change it can provide. The ketogenic diet is the well-circulated weight loss technique which requires a thorough understanding of the science behind how it works. The food one intakes when on this diet, coaxes the body to make molecules called ketones which acts as an alternate fuel source for the body used when the body runs out of fuel which is blood sugar. When carbs are cut from the diet, the body uses proteins and liver produces fat which becomes the fuel for the body. It helps not just lose weight but also hunger pangs. It is also said to reduce inflammation and improve brain function. This diet needs to be a well guided one and Scott Gooding in The Keto Diet provides a realistic potion of the portions you ought to intake supported with science and delicious recipes. It is a practical guide to how to kick start a new lifestyle.